Mites that feed on plants, “Phytophagous Mites”, are becoming increasing prevalent in turfgrass across a range of host species. 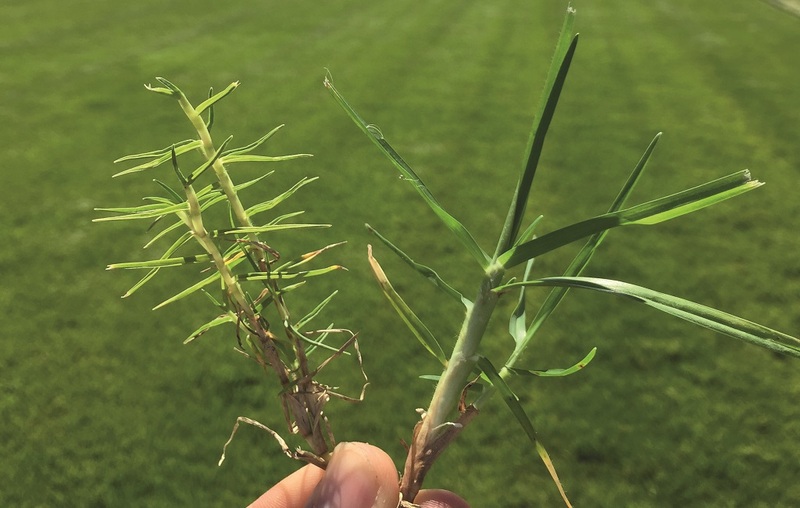 Damage has most often been observed on Cynodon dactylon cultivars and hybrids, but observations and reports have identified damage to Kikuyu and Zoysia. This is not surprising as our knowledge of the pests continues to grow and with it, a better understanding of symptoms and species. Phytophagous mites are a highly diverse group that have evolved with great diversity in the environment, with more than 6000 species of plant-feeding mites known worldwide. As our understanding of how they affect turfgrass grows, it is inevitable that we will identify new symptoms of mite damage and new mite species that may have even been misdiagnosed as other biotitic and abiotic stress factors. small size and positioning tight in sheath creating difficulty in contact control. It is important to note that mites are not insects and are more closely related to arachnids such as spiders, scorpions and ticks. With this comes a range of morphological differences, such as fusion of body parts and number of legs. Because of this difference, it is important to note that management strategies will require approaches different to other commonly treated turf pests like beetles and caterpillars. However, with the correct timing and strategies, such as placement of product targeted at mite zones, we can ensure effective control of mites, and reduce and manage their damage affects. Figure 1: Porpoising - compressed leaf sheathes with short fattened leaves under heavy mite infestation. Syngenta 2016. Figure 2: Mite affected Kikuyu on left with stunting and discoloring and healthy Kikuyu on right. Syngenta 2017. Most common curative treatments are undertaken once damage has occurred and mite populations are established. Some turfgrass mites such as Aceria cynodoniensis can lay as many as 50 eggs every 2-5 days and complete a full life cycle within 10-14 days. This rapid life cycle leads to explosive populations. 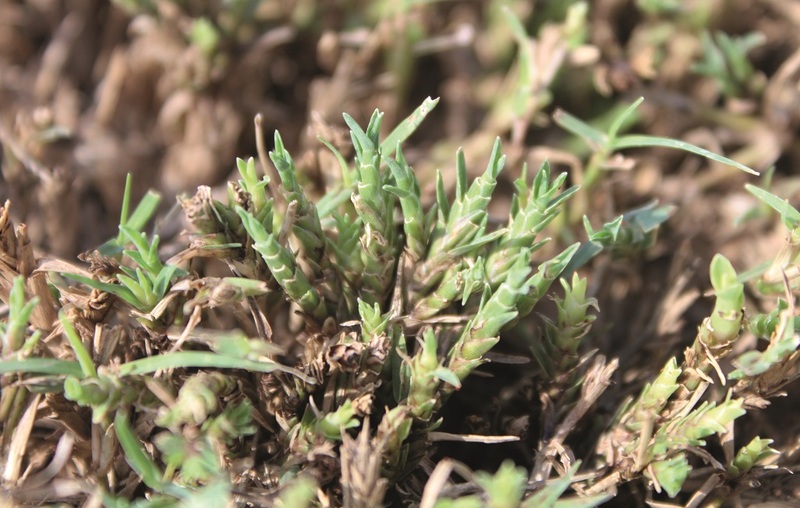 Once established, there can be a lag phase in controlling the population and in the recovery of the affected turfgrass. The rapid generational times mean incomplete control of any given generation leaves the door open for exponential growth of new populations. Hence we often see mite problems become very big, very quickly, with treatments not delivering the desired effect. This occurs when treatment timing and placement does not get to the location of the tiny mites, due to protection from areas like the leaf sheath which create a physical barrier to control. Timing and early treatment – before damage – is critical in good management of turfgrass mites, and it starts with identifying a mite problem as guided by previous years. Figure 3: Rapid life cycle of Aceria cynodoniensis that regularly damages couch grass. Early mite identification and monitoring is critical to the success of any mite management program. An integrated approach comprised of cultural, mechanical and chemical components is required for mite management programs. Culture aspects like adequate water and nutrient support improve recovery and resilience of turfgrass to mite damage. Mechanical treatments like raising mowing heights and disposing of infected clippings reduce the spread of mites and increase resistance to damage. The chemical component is critical to keep populations in check when pest pressure is high to ensure damage and stress does not occur, yet it can be the most difficult to achieve for effective control if applications are not spot on. It requires critical thinking around application timing and placement, product selection, tank additives, and long term resistance management through rotation to ensure the best outcome. The seasonal and year-on-year variation seen in mite populations is largely a function of the widely different environmental conditions that occur through spring and summer, not to mention the microclimatic differences that occur between and within turfed areas. But a long, dry winter often triggers increased mite pressure coming into spring and summer. It is suggested that regularly occurring day temperatures over 20° in late-spring/early-summer are optimal for many turfgrass mites. A fast acting knockdown miticide should be selected to reduce mite populations followed by a long lasting product that can break the life cycle of the remaining population. 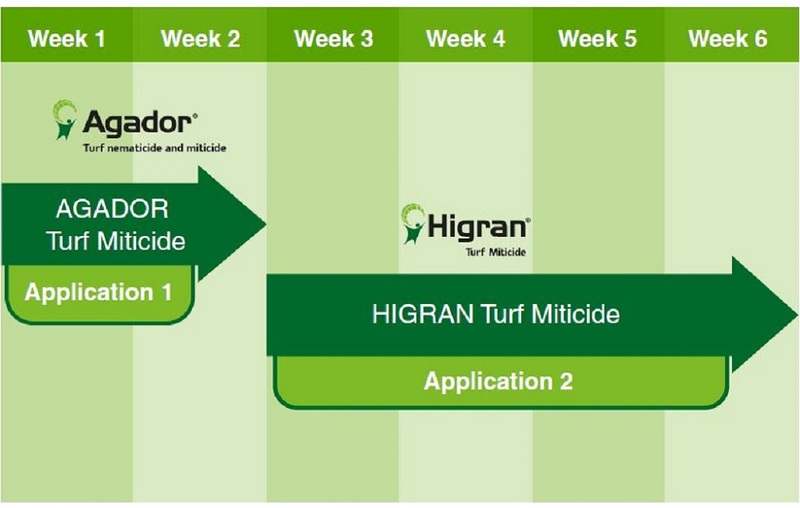 To demonstrate this, we will use the Syngenta mite program which rotates AGADOR and HIGRAN. This strategy rotates different modes of actions to ensure good resistance management practices. Both these products deliver control through feeding on product stored in a reservoir in the plant, as most control does not occur though contact as often perceived. Abamectin (AGADOR) – the knockdown specialist – has been the registered active ingredient that has shouldered much of mite management in Australia. This specialty formulation is a chelated formulation that delivers a beneficial greening of damaged turf. It has excellent turf safety qualities and miticide behaviors in terms of its ability to translaminar through the leaf tissue (movement from one side of the leaf to the other). All the while maintaining a sub-laminar reservoir of active ingredient in the leaf surface, waiting for the mite to feed and draw a treatment dose. This ability to move off the leaf surface and sit below also means it has an excellent profile against most non-targets. This is because much of the mite kill is not from contact but uptake of abamectin from the sub-laminar reservoir. Diafenthiuron (HIGRAN) – the life cycle breaker – is an excellent example of a product that provides longevity in a different mode of action group from abamectin. This very strong miticide moves in a translaminar manner post application to sit below the leaf surface, reducing risk to non-targets as with abamectin, whilst also possessing other special properties that make it an effective miticide with excellent longevity. Firstly, it creates a vapour film around the treated leaf ensuring control of mites in tight areas that are generally difficult for liquid products to reach. Secondly, the product gradually transforms post application into the chemically active form (i.e. the miticidal compound) giving it greater overall longevity over knockdown products and opening the door for extension of control in terms of time. It has also been reported to have ovicidal action on mites that targets life cycle right back to the egg stage. As part of a program, diafenthiuron ensures a reduced number of applications when compared to a traditional program of repeat application of abamectin, often with reapplication timings as low as 7 days. Other benefits are a reduced overall program cost and reductions in resources required to apply product. To achieve higher levels of control, faster, it is important to target as much of the mite life cycle as possible. When used in a program together, AGADOR and HIGRAN target the adult and nymph stages which make up 90% of the mite’s life cycle. 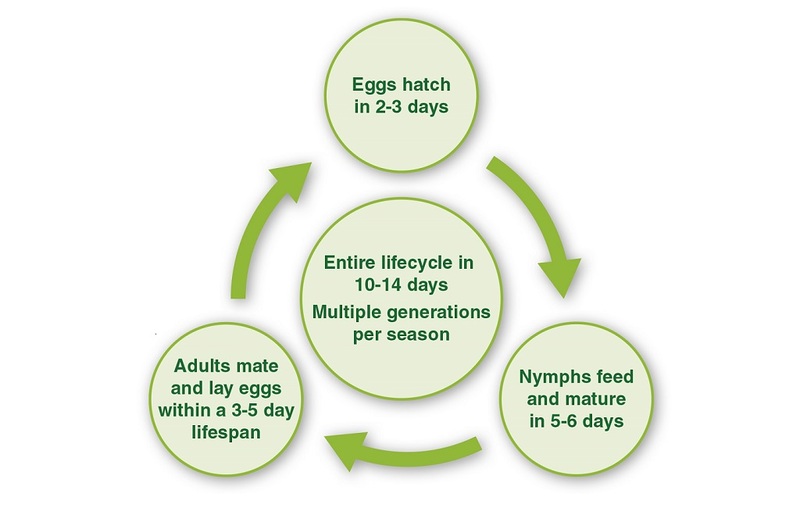 Figure 4: Example Syngenta base mite program to deliver population knockdown and life cycle breaking longevity giving an effective control period of up to 6 weeks. Placement is critical to the success of any chemical application. With all applications, we are aiming for even coverage, minimal drift, and placement within the correct plant zones. Directions of use on product labels clearly define the best water rate that will give the most reliable level of control for individual products. For mites, we are targeting the foliage of the turf. This is best achieved with 300–500 L/ha of water delivered though medium droplet size nozzles such as Syngenta XC025 and XC04. Higher water volumes are more appropriate for higher cut turf areas such as sports fields and golf course roughs. The added benefit of the Syngenta XC nozzles is the back facing angle which ensures more droplets per m2 compared with over traditional air induction nozzles and improved front and back leaf coverage. Many miticide labels call out specific recommendations for the inclusion of adjuvants/surfactants. Such recommendations are based on results that demonstrate inclusion improves results and efficacy. More information can be found in the directions of use section for specific products labels. For example AGADOR and HIGRAN miticides have a clear direction; “The addition of a quality non-ionic surfactant at a rate of 0.25% v/v (1000 g ai/L products) or 0.42% v/v (600 g ai/L products) such as Agral Spray Adjuvant is essential.” For 25% v/v (1000 g/ai adjuvant) this would be would be 250 mL/100 L of adjuvant in spray solutions and for 42%% v/v (600 g/ai product), 420 mL/100 L of adjuvants in spray solution. The inclusion of the adjuvant/surfactant reduces water droplet tension when it comes into contact with foliage, resulting in better spread over the leaf surface, treating more area and entering tighter spots while providing better adherence to the foliage. Some products may also reduce drying times and improve absorption into the leaf. The sheer number of offspring produced by an adult mite and short generation times increases the risk of resistance development to chemical controls – it’s a numbers game. More mites means greater opportunity for a naturally occurring change leading to resistance of a particular selection pressure, in this case the repeat use of a single mode of action chemistry. How far advanced this situation currently is will vary between sites, however it would be inconceivable to think it has not commenced. To ensure resistance risk is reduced, rotation of product mode of action is critical for long-term success. Even though mites are not obvious to the naked eye, the damage can be profoundly evident from these tiny pests. Damage leads to poor playing conditions and weak turf that costs more to maintain and repair. Mites are very successful pests due to their tiny size, short life cycles, and ability to rapidly increase in numbers. By putting into practice strong cultural and mechanical management supported by chemical based management programs, mites won’t be your turf ’s undoing this summer. We have the tools and the knowledge to ensure target treatments that place control measures where they are required and provide long-term success. If you require support in your mite programs, contact the Syngenta team. Couchgrass Mite is a notoriously hard to control insect pest.